Subscribers respond well to calls to actions for upcoming events. 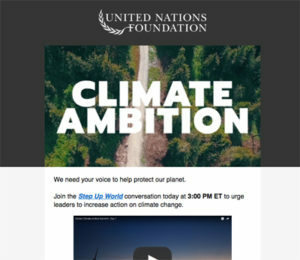 When AJ Jacob joined the United Nations Foundation last year as digital development officer, the organization was ready to make big changes to its email marketing program. Her challenge was to revamp the email strategy in three months—before the pivotal end of year crunch for nonprofits—and reengage the inactive subscriber base. Evaluate your ESP. 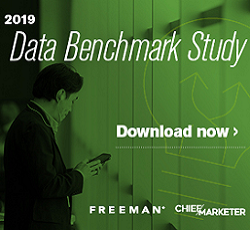 Changing email service providers can be a major investment of time and money, but it can be worth it if it will improve your subscriber experience. Consider factors such as whether they have a dedicated IP, how user friendly their tools are, how much ability there is to customize and what the options are in the future for segmentation. Be strategic in your redesign. “Design plays as central role in perceived legitimacy for a digital audience,” Jacob notes. Make all your templates and landing pages responsive and remove unnecessary clutter from your email templates, creating with a “human-first” design aesthetic in mind. Know your audience. It is essential to know who you are writing your email copy for, she says. For the United Nations Foundation, for example, their audience was comprised of very engaged citizens, as well as subject matter experts and more casual readers who might not even remember signing up to receive messages from the UN. Have a strong call to action. Figure out what works best for you. “Learn why it matters” may perform better than “Read more.” For the UN Foundation, direct fundraising not surprisingly aren’t the strongest CTAs, but invitations to events and surveys—both of which can be indirect fundraising tactics—get a good response. Surveys also have the benefit of serving as a strong collection tool for self-reported data. The UN’s new supporter survey gives subscribers an opportunity to self-identify themselves as prospects for volunteering, advocacy and even major gifts. Jacob shared the United Nations Foundation’s five pillar segmentation model for its email subscriber base. Recency: When was the last time they engaged with a message? Are they a new subscriber? Have they opened a message this week—or not for a year? Supression: Why are they on this list? Did they have a negative interaction with the organization? Or, are they a VIP, and it would be inappropriate to send them messages with things like an ask for a low ticket donation?